250 pages | 14 B/W Illus. This study guide offers a systematic, comprehensive and focused approach to preparation for the MRCOG Part 3 Clinical Assessment exam. After an initial introduction, the text divides by OSCE station, beginning with an analysis of what the station is testing and what approaches and preparation are required, supported by tips and examples; this is followed by thoroughly worked practice questions based upon the exam format, with an analysis of how these are likely to be marked. Practice exam 'circuits' with fully worked questions and answers conclude the book. Mr Justin Clark trained in Obstetrics and Gynaecology in Leicester, Birmingham and the West Midlands and obtained the Membership of the Royal College of Obstetrics and Gynaecology (RCOG) in 1999. He spent two years conducting research into heavy menstrual bleeding, pelvic pain and endometriosis culminating in a Doctor of Medicine awarded with honours in 2004. He was appointed as a Lecturer in Gynaecology at Birmingham University and Consultant in Obstetrics and Gynaecology at the Birmingham Women’s Hospital in 2004. He has developed clinical expertise in the management of general gynaecological conditions, especially the treatment of menstrual disorders, fibroids, pelvic pain and endometriosis. This capability was facilitated by the acquisition of RCOG accreditation in minimal access ‘key hole’ surgery, specialising in hysteroscopic and laparoscopic techniques, and gynaecological ultrasound. He has been at the forefront in pioneering outpatient interventions for the diagnosis and treatment of menstrual disorders utilising hysteroscopy and ultrasound. His strong research background and clinical experience enabled him to publish a definitive book in 2005 about the modern management of common gynaecological problems utilising minimally invasive approaches. He is one of the leading UK experts in outpatient therapeutic interventions in benign gynaecology including outpatient ‘office’ hysteroscopic removal of polyps and fibroids, endometrial ablation and the new ‘non-cut’ outpatient method of female sterilisation (the ‘EssureTM’ system) that avoids the need for general anaesthetic and hospital admission. Professor Arri Coomarasamy is the Director of Tommy’s National Centre for Miscarriage Research, with specialist teams in Birmingham, Coventry and London, putting patient priorities at the heart of efforts to tackle the widespread and devastating condition of early pregnancy loss. He leads a research group at the forefront of early pregnancy care, reproductive medicine and global women’s health. His portfolio includes numerous national and international multicentre randomised controlled trials, including the PROMISE trial (the role of progesterone in women with unexplained recurrent miscarriages), the TABLET Trial (levothyroxine therapy for women with thyroid antibodies), the PRISM Trial (progesterone therapy for women with early pregnancy bleeding), the RESPONSE Trial (G-CSF treatment for recurrent miscarriage), the AIMS trial (the effects of prophylactic antibiotics before miscarriage surgery in low-income countries) and the WHO CHAMPION trial (the role of carbetocin to prevent postpartum haemorrhage). He has published over 120 medical articles in high impact journals such as NEJM and the Lancet. Professor Coomarasamy takes particular pride in mentoring junior doctors and researchers, and several of his trainees have become outstanding clinicians and researchers. He serves or has in the past served on several international and national committees, including the BJOG editorial board, the RCOG Wellbeing of Women Research Panel, various WHO committees, the Early Pregnancy Clinical Studies Group, the Reproductive Medicine Clinical Studies Group, and the GLOW organising committee. He is the founding trustee of Ammalife, a UK-registered charity with a global mission of reducing maternal deaths in low-income countries. Dr. Justin Chu is an academic clinical lecturer in obstetrics and gynaecology. He completed his PhD by medical research at the Institute of Metabolism and Systems Research at the University of Birmingham. Justin is based at the Birmingham Women's Hospital. His research interests lie in embryo implantation in assisted reproductive treatments, miscarriage and reproductive surgery. Clinically, Justin is a senior registrar in Health Education West Midlands. Justin has organised and taught on MRCOG courses for the past 4 years since gaining his membership of the Royal College of Obstetricians and Gynaecologists. 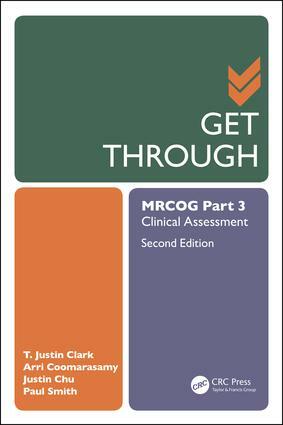 His experience in teaching on the course has gained detailed insight in to the new format of the Part 3 MRCOG Clinical Assessment. Dr Paul Smith is an NIHR post-doctoral research fellow based at the Birmingham Women’s and Children’s Hospital NHS Foundation Trust. He combines his academic work with clinical duties as a registrar in Obstetrics and Gynaecology. Paul’s main research interests lie in benign gynaecology, early pregnancy and clinical trials. He is a key member of the Birmingham Tommy’s National Centre for Miscarriage team. Paul has several high impact journal publications and has received prizes for his work including the Harold A. Kaminetzky Prize for the best paper by a non-US researcher in the Green journal (ACOG) and the Golden Hysterscope award for the best paper in hysteroscopy at the AAGL. Paul has been awarded several successful research grants such as the UCON (Ulipristal acetate versus conventional management of heavy menstrual bleeding) trial (co-applicant) funded by NIHR EME and his personal award for the 5-year NIHR post-doctoral fellowship. Paul is currently undertaking an exciting body of work looking at improving miscarriage services. This includes the creation of a core outcome set using qualitative methodology and running a clinical trial to investigate the use of ultrasound in management for surgical miscarriage.